When God puts a deadbolt on something, DON’T USE THE BOLT-CUTTERS! ILLUSTRATION: This past week we were shooting scenes for the film, “Redeeming Hope”. One of the locations that we wanted to shoot a scene or two was down in Baltimore on Eager Street. The Baltimore County Detention Center. We pulled up the picture on Google to see if it would make a good set for the scene. We noticed that there was a chain and a lock on the gate. We really wanted to get a shot of me as Denver McCabe coming out of that gate as he was released from jail. As we were talking about how to make that shot work, I mentioned that I had a pair of bolt cutters. Brother Garraway was excited. He said, “Really? ?” I said yes. He said, “Can we go get them?” I said, “Are you serious?” He said, “Yes!” I said, “Let’s make this real. If I go get them, will you be the one to cut the chain?” He just looked at me. I said, “It just got real didn’t it? ?” He said, “We won’t use them, but let’s go get it anyway, just in case.” I said, “If we aren’t going to use them, why get them?” He said, “Just in case.” So, we went back, to the house, and I asked my son Stuart to go get them out of the shed and put them in the back of the truck. The same son that I have tried to teach for 19 years to obey the law and not ever participate in anything ungodly or illegal, like BREAKING AND ENTERING, I had him go get the bolt-cutters and put them in the truck JUST IN CASE WE DECIDED TO BREAK THE LOCK. This has to be first time in history that two Baptist preachers (oh wait, Brother Caleb Kasprzyk was with us and was 100% complicit, as well as Brother Adriel Payne, one of my staff members!) Here we are, talking and thinking and planning on breaking INTO jail; not out of jail; INTO jail!! Here I am, with one of our missionaries, two of my full-time assistants, and my son, and I’m planning a jail break! O WRETCHED MAN THAT I AM, WHO SHALL DELIVER ME FROM THIS BODY OF DEATH?? Nobody PLANS to sin, but they make provision just in case they change their mind. The problem is not getting the door open; the problem is what is on the other side of the door. The problem is not getting the door open. I could have gotten that gate open in about 30 seconds. The problem would have been all the other doors that would have opened afterwards that I didn’t want to enter. Like the back door of the patrol car when they shoved my handcuffed carcass up in the back seat. Like the door of the police station when they walked me in to book me. Like the door of the fingerprinting room and the mug shot room. The problem is not USING THE BOLT-CUTTERS; the problem is what happens after you do! I’ve seen men and women pull out the BOLT-CUTTERS and break their vows to be faithful to their spouse. I’ve seen couples choose to get out the BOLT-CUTTERS and break the bonds of holy matrimony. I’ve seen people choose to get out the BOLT-CUTTERS and lose their virginity before they are married. I’ve seen women get out the BOLT-CUTTERS and walk in an abortion clinic and cut the cord of that little unborn life. I’ve seen church members get out the BOLT-CUTTERS and sever their relationship with their local church. When God puts up a NO TRESPASSING sign, guess what that means? When God puts up a DO NOT ENTER sign, guess what that means? ILLUSTRATION CONCLUSION: We got down to Eager Street, and after walking around and looking, we discovered several gates that were open. We were able to go into several little walkways and even a really cool prison yard and film scenes without having to use the bolt-cutters. I’m so glad we left the bolt-cutters in the truck!! And I didn’t have to spend the night in Baltimore County Detention Center! Many times we have an idea of what we would like to do for the Lord. Sometimes, it is a great idea. Many times, it is a tremendous burden or desire. But God hasn’t opened that door. If we are not careful, we will pull out the bolt-cutters and make a way where there is no way. 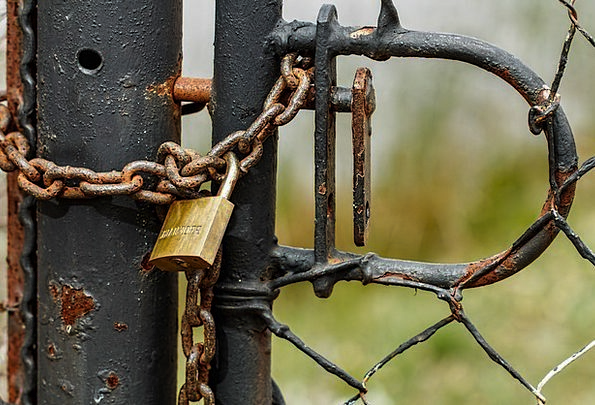 When God puts a chain and a lock on a ministry opportunity, DON’T USE THE BOLTCUTTERS! ILLUSTRATION CONCLUSION: After we filmed for about an hour, I looked across the street and saw an old abandoned building with a lot behind it. To make a long story short, we walked across the street and the gate was wide open. We went in that vacant lot and shot 4 or 5 scenes. MORAL OF THE STORY: We could have got out the bolt-cutters and got a good scene, but because we didn’t, God allowed us to get a better place for multiple scenes, and the gate was wide open. There are those that will take the word of God and in an attempt to make it say what they want it to say, or mean what they want it to mean, they will in essence take a pair of bolt-cutters to it and force it. There are simply some truths that God hasn’t opened up to us. There are some things that we just have to trust Him and let Him reveal it in his time. God conceals, and God reveals. Don’t get out the bolt-cutters where God has hidden something. People are always trying to predict end times events. They set dates, they write books about the date, etc. Not even the Son of God knows the day or the hour. Don’t get out the bolt-cutters where God has said something. If God said don’t do it, stop looking for the bolt-cutters. Just don’t do it. Just because you and I don’t understand a passage, or agree with a passage, we cannot wrestle the Scripture to make it say what we want it to say. We cannot twist and pry and pervert the Word of God to fit our circumstances. Those that are unlearned and unstable will get out the bolt-cutters and try to change God’s intentions UNTO THEIR OWN DESTRUCTION! !